Which bead do you put the essential oils on and how much? Place the oil on the porous lava bead (there is at least one on each bracelet). They are the ones with small visible “craters” on them. You can drop 1-2 drops of oil on to it (a little goes a long way) and it will naturally diffuse for 2-3 days. Our bracelets come with a small vial of organic lavender oil which can be used as a 'starter' oil. After 2 or 3 days, the aromatherapy on the lava will start to dissipate. You can use more of the lavender oil on them or switch to any other kind you’d like. There are certain oils--depending on their concentrations/formulas-- that will last as long as a week! You can reapply oils as often as you prefer and any oil that you like. What if my bracelet breaks? We guarantee every product we make and if your bracelet breaks from normal use, we will restring it at no extra charge. You just pay the shipping to us and we will ship it back after fixing it. We are happy to fulfill any return and exchange requests for any reason (size exchange, changed mind, etc.). We are strict on our quality and if you have any problems with the stones or quality please don’t hesitate to let us know. We will rectify the issue and strive to constantly be the best, so your input is important to us. 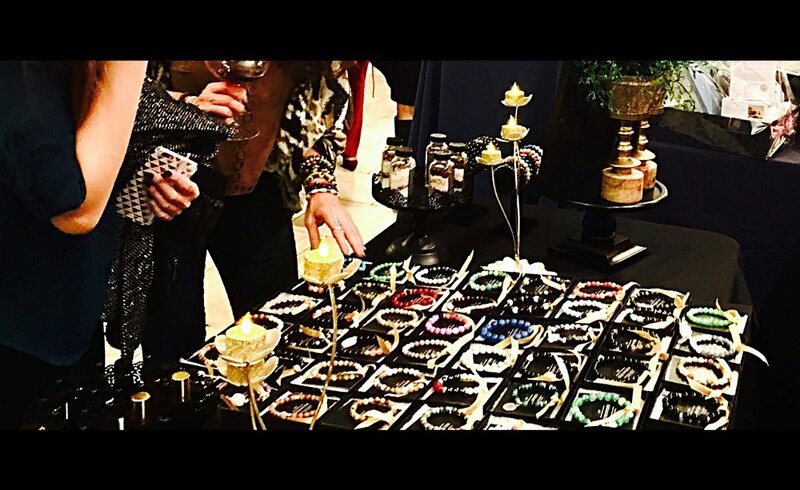 Each and every handcrafted Aura bracelet is unique and may vary slightly from each other (size, shade and color) and from the picture on the online store. This is because they are genuine stones made by nature! Our natural gemstone bracelets do not require any specific type of cleaning. Though many believe in the natural ability of the stones to absorb negative energies and do keep them in sunlight or moonlight once a month to cleanse their vibration. Though most of our charms are of high, non-tarnish quality, we do not recommend swimming or bathing with your jewelry pieces. Does Aura Rituals offer Wholesale Orders to Stockists? Aura is pleased to offer retail stores and business owners bulk orders (over 10) at our special wholesale prices. We currently do wholesale orders via email. We require a minimum order of 10 items and they can be a mix of any items. Please email us at info@aurarituals.com for more information. How Long Will Delivery of My Bracelet Take? We use USPS two day mail. Shipping is free for all domestic orders. Please allow 3-5 business days for processing before being shipped out. You will receive a tracking number in a shipping confirmation email as soon as your order is shipped. We do custom designs for orders over 10 bracelets for special occasions such as weddings, showers, etc and can offer design options. Please contact us at info@aurarituals.com for more information.